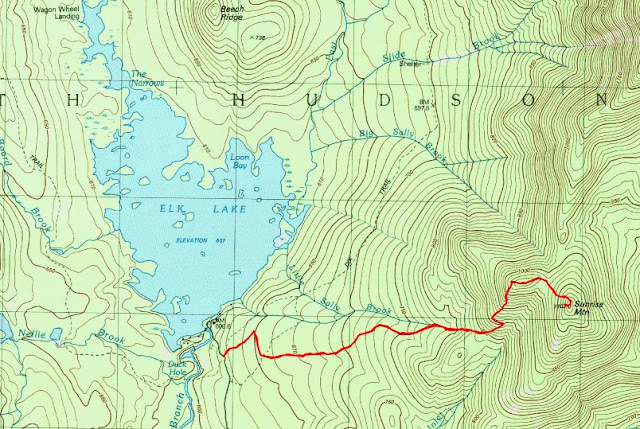 Bald Peak is a great half day hike from Route 9 in New Russia. It's a good workout with 2500' of vertical gain over the course of 7.8 miles. I was spending the day with my lovely daughter Lindsay and we opted for a half day hike and a half day paddle. 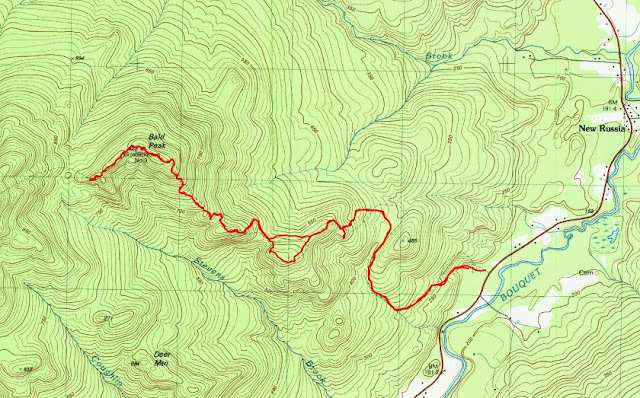 I threw out a few suggestions for the hike portion of the day and described the features of each hike. She chose Bald Peak. We started on the trail at 9:30. It was a beautiful day and that is partly why we got together on this day. We had a nice breeze and the bugs were non-existent all day. The first thing I noticed as we started hiking was all the flowing water. In my mind I had it that this trail was quite dry, but after the rains we've had, there was water most of the way up. That was great for my dog Rev. It gave her a chance to drink almost whenever she wanted. After 45 minutes we arrived at the 1st viewpoint. We stopped here for a drink before continuing on. Soon we passed over Blueberry Cobbles. From Blueberry Cobbles the trail drops several hundred feet to a col and then resumes the climb. There is another small bump with a ledge that provides a good view of Bald. There is another small drop then the steep portion of the climb begins. Open rock soon appears and you can spend time looking at the scenery while you climb. Near the summit of Bald Peak. Rock Peak Ridge in the distance and Giant Mountain on the right in the background. As we approached the summit, we passed a group of rock cairns of various shapes and sizes. Someone has been practicing their cairn building technique. Lindsay is soaking up some sun. Rev doesn't see the point. 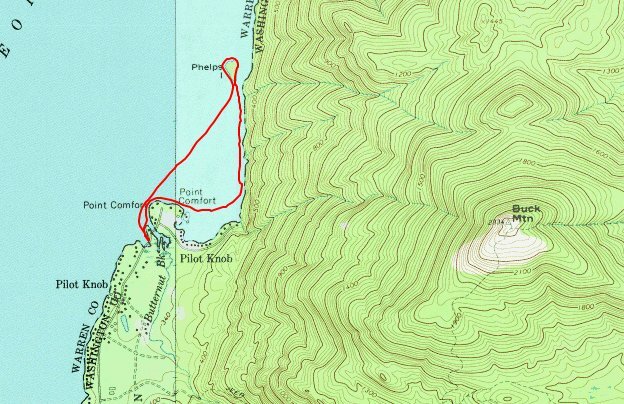 If you do this hike, don't stop at the summit of Bald Peak; take the time to walk along the subsequent ridge, past a large glacial erratic to another viewpoint at the far end of the ridge. This ridge walk reminds me of the Jay Mountain Ridge and it's worth the extra short walk. At the far end of the ridge, the trail drops steeply into a col before climbing steeping towards Rocky Peak Ridge. 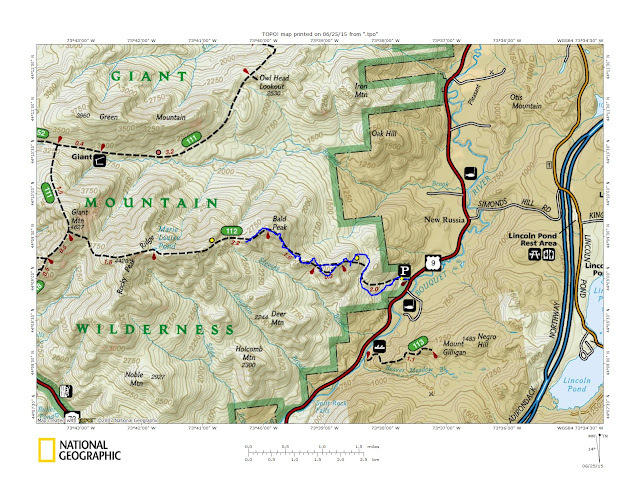 This is a good place to turn around if you are only looking for a half day hike. A zoom view of Iron Mountain to the north.... a great bushwhack destination. This is the view from the viewpoint at the west end of the Bald Peak ridge. On our way back, we took the shortcut trail to bypass Blueberry Cobbles. Once at the car, we headed towards Lake George to get our afternoon kayak paddle underway. We didn't see anyone all day until the last mile when we saw a couple heading in. 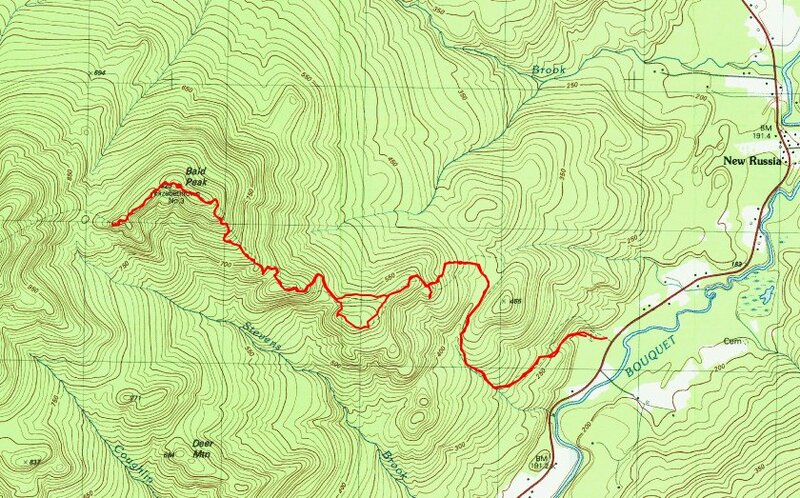 This trail doesn't get much use; mostly just through hikers doing the Rocky Peak Ridge traverse. There is no doubt about it, the Elk Lake Lodge and Forest Preserve is a beautiful property. A wonderful lodge, on a glorious lake, surrounded by 12,000 acres is tough to beat. Leesa and I took advantage of being on property to climb both Sunrise and Boreas Mountains. Leesa wanted to see sunrise on Sunrise Mountain, but it wasn't to be. Rain overnight followed by morning clouds, held the sun back. We started our hike to Sunrise at 5:40 AM. The mostly sunny skies were predicted starting around 8 AM, so we thought maybe we could see some interesting clouds as skies cleared. We headed into the woods parking lot and trailhead for the Dix trail. After 0.25 miles we turned onto the private trail to Sunrise Mountain. The lower part of the trail follows and old woods road. There was lots of water in the trail and our boots were soon wet. As the woods road turned into a foot path, the trail paralled Little Sally Brook. Soon the trail became drier and we began to climb in earnest. The trail was quite pleasant when we got out of the water. The Sunrise Mountain Trail offers two nice viewpoints prior to the summit. We, of course, stopped at each of them. Clouds were still dominant, but there were signs that skies were clearing. Elk Lake from the first viewpoint. Clear Pond from the 1st viewpoint. The 2nd viewpoint wsa nice as well, although there were limited views of Clear Pond. We continued on and reached the summit after 90 minutes of hiking. Leesa was excited to see the interesting clouds that we had hoped to see. We couldn't tell if it was going to rain or clear. For a few minutes, the skies were growing increasingly dark and it began to sprinkle. Looking north from the ledge adjacent to the true summit. Nippletop Mountain in the background. Cool clouds to the south. We stayed on the summit for 20 minutes watching the cloud change, then began to head down. The sun began to make its' presence known almost immediately. By the time we got back to the lower viewpoints, the view looked entirely different due to the appearance of blue sky. Elk Lake under under some blue skies by 8 AM. We made our way back down through the wet lower portion of the trail and were soon back at the lodge. The hike was 5 miles round trip and took 3 hours to hike. At the lodge, I took a couple pictures of Elk Lake while Leesa change her socks. The view of Elk Lake from the Lodge. 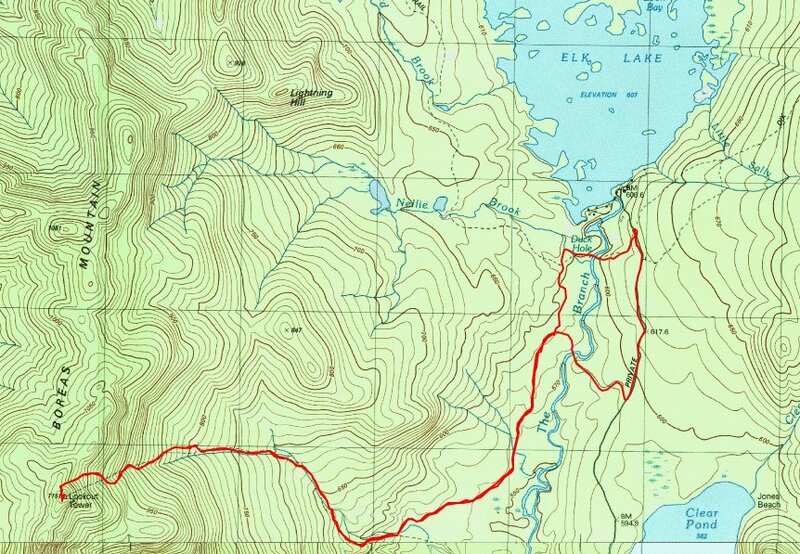 Next it was time to head for Boreas Mountain. We started on the trail to Panther Gorge. We crossed the suspension bridge over "the Branch" and continued until the point where the marked trail made a sharp turn to the right. We continued straight to head towards Boreas. We left the state trail here and continued straight towards Boreas Mountain. Soon we came out onto a logging road which we following for 1.4 miles. Mosquitoes were suddenly horrendous, after having no problems all morning. We both put on Deet and headnets. After 1.4 miles, we crossed a new wooden bridge and immediately came to a sign on the right saying 2.1 miles to Boreas Mountain. We turned here and were now on the old woods road to the former fire observers cabin. The mosquitoes left us at this point. This is where we left the logging road and began to climb on the trail. This clearing is where the fire observers cabin used to be. After 1.2 miles, we reached the clearing where the cabin used to be. At this location, the old woods rooad transitioned to a foot trail and became increasingly steep. We climbed 1100' from this location to the summit of the course of 0.9 miles. At last we reached the summit. We both took off our boots and sat down on the summit rock to eat lunch. 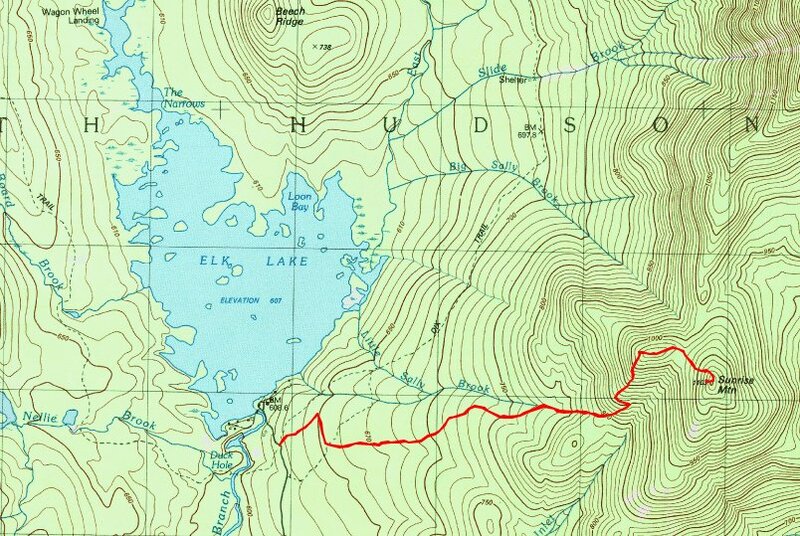 From Boreas, there are views of Elk Lake, Clear Pond, Maccomb Mountain, Hough Peak, Dix Mountain, Nippletop, Blake, Colvin, Haystack, Marcy, Skylight and the whole upper half of the Great Range. The USGS Geodedic Survey marker on the summit of Boreas Mountain. Elk Lake with Dix, Hough and Macomb in the background. The upper Great Range shrouded in clouds. Our route down was the same except that we followed the logging road all the way out to Elk Lake Road (one mile south of our car), then followed the road back to the car. 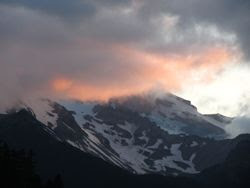 It was great to spend time at Elk Lake Lodge and to hike these two wonderful peaks. The Elk Lake private trail to Boreas Mountain.